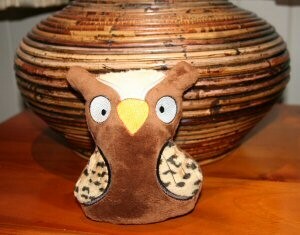 The Owl Softie is an in the hoop project sure to delight young children as tested in our own home. 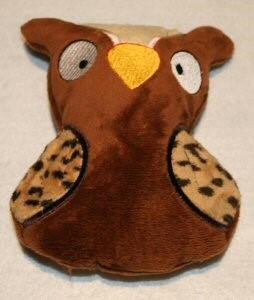 Our children just adore these cute and soft little owls. These are great as toys or even an original pin cushion. This project is in the hoop with just a little hand sewing required to close the opening left to turn the project inside out and stuff with hobby fill. 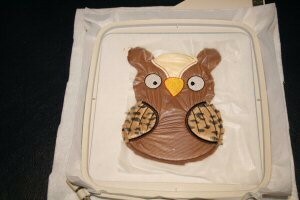 The completed owl is just over 6 inches tall and takes about 40 minutes to take. 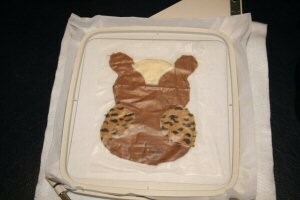 This project uses our Owl Softie 5x7 embroidery design set. Following is a step by step picture guide to completing the owl softie. Hoop tear away stabilizer. We used two layers of a good quality tear away. Tighten hoop so stabilizer sits well in hoop. Stitch out first needle. The first needle stitches out a placement line to place your first layer of minkee fabric. Remove hoop from machine. 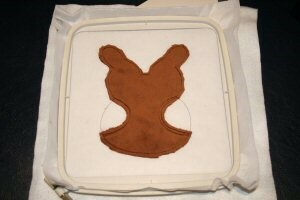 Lay a piece of Minkee right side up over the stabilizer where the placement line has been stitched. Smooth the fabric down so there are no air pockets. 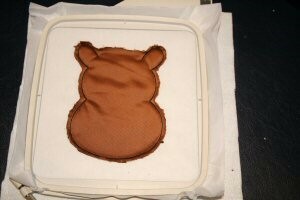 Carefully put the hoop in the machine and stitch out needle two which is the cutting line. Once Needle two is stitched remove the hoop from the machine. Use a pair of nail scissors to trim around the cutting line. Do not cut too close to the cutting line – we left a couple of millimeters as a seam allowance. 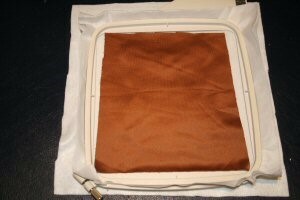 Return the hoop to the machine and stitch out needle three. Needle three is the placement line for the wings. Then remove the hoop from the machine. Lay a piece of Minkee right side up over the placement lines. Smooth the fabric down so there are no air pockets. Carefully put the hoop in the machine and stitch out needle four which is the cutting line for the wings. 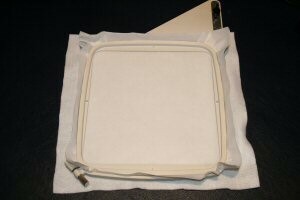 Remove the hoop and trim around the cutting line. On the outside of the wings where the line follows the shape of the body of the owl you will want to leave a seam allowance similar to how you trimmed the body of the owl. On the inside of the wings (ie the sections running inside of the owl body) you will want to trim as close to the cutting line as you can without snipping the stitches as an appliqué border will be stitched over this edge. Return the hoop to the machine and stitch out needle five. Needle five is the placement line for the top of the head. Then remove the hoop from the machine. 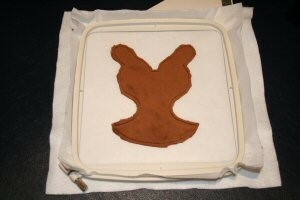 Lay a piece of Minkee right side up over the placement line. 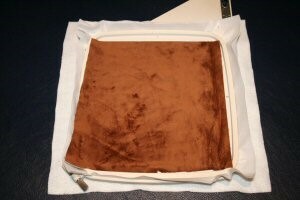 Smooth the fabric down so there are no air pockets. 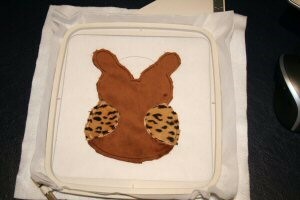 Carefully put the hoop in the machine and stitch out needle six which is the cutting line for the top of the head. Remove the hoop and trim around the cutting line. On the outside of the top of the head where the line follows the shape of the body of the owl you will want to leave a seam allowance similar to how you trimmed the body of the owl. On the inside of the top of the head (ie the sections running inside of the owl body) you will want to trim as close to the cutting line as you can without snipping the stitches as an appliqué border will be stitched over this edge. 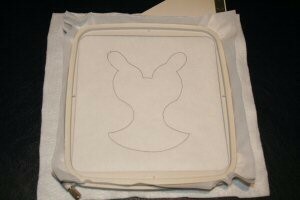 Lay a piece of water soluble stabilizer over the whole design, smoothing it out to reduce air bubbles and carefully return the hoop to the machine. 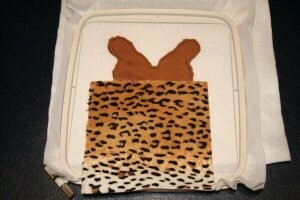 The water soluble stabilizer will prevent the fabric poking through the face details which is the next step. 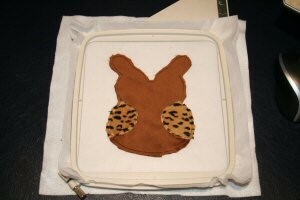 Stitch out needles seven to twelve which are the appliqué borders for the wings and top of head, the nose, nose outline, eyes, and eyes outlines. Remove hoop from machine. 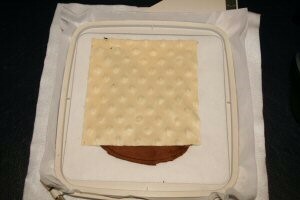 Carefully remove water soluble stabilizer and if any little bits are left, remove using a damp cloth. 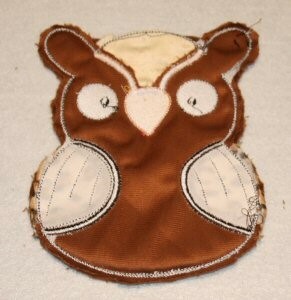 Carefully put the hoop in the machine and stitch out needle thirteen which is the seam line for the whole owl. Lay a piece of Minkee right side down over the placement lines. This means that the soft sides of the fabric should be face together as the project will be removed from the hoop and turned inside out (see rest of instructions) Smooth the fabric down so there are no air pockets. Remove the hoop and trim around the seam line leaving a couple of millimeters to form the seam. Remove the project from the hoop and carefully snip all jumps in the bobbin thread and remove tear away stabilizer. Please note this picture was taken on felt, the stabilizer has been removed and the owl is sitting on white felt for the picture. I did not remove the tear away from the wing area but in hindsight it would have been better to remove it as it is a little ridged when left in the finished doll. Turn project inside out through opening in the top of the head. Stuff owl with hobby fill. Using needle and thread hand stitch the opening at the top of the head. Now you have a beautiful owl softie that will delight young and old. 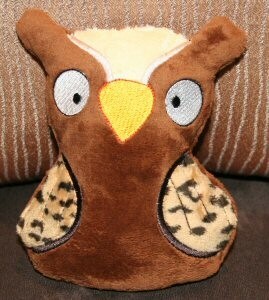 I hope you enjoyed making your owl softie. Have a lot of fun with different colors to make this a truly unique project! I would just like to say how wonderful your designs are, I just love using them. Keep up the great work.